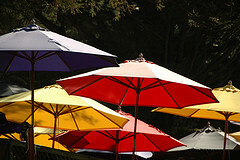 1) The Umbrella Cover Museum in Peaks Island, Maine. I don’t know about you, but I feel inspired. I may not own an umbrella, or an accompanying cover for that matter, but if I ever find myself in Peaks Island, Maine you better believe I’ll stop by to learn about what I am missing. 2) The Museum of Bad Art in Deadham, Massachussetts. Short, sweet, and to the point. Proving there is no accounting for taste, but at least you can have a sense of humor about it. Um, exactly. Wait, I thought only rich people could be eccentric? Everyone else is just plain crazy. Oh well, dream big. 4) The Texas Prison Museum in Huntsville, Texas. Did they mention they’re in Texas? Certainly conveys a sense of place. Only issue: doesn’t exactly make clear what they plan to educate the people of Texas, oh, and the rest of us, about. 5) The International Towing and Recovery Hall of Fame and Museum in Chattanooga, Tennessee. Apparently there was an urgent need for an establishment for passionate towing and recovery enthusiasts to gather, and that need has been filled. Thank you. Staten Island isn’t so bad. Look, it even has museums. Meanwhile, Barak is headed to Orlando. Well, at least a gumball version is.